Help us make sure that plastic doesn't pollute the ocean! The Great Bubble Barrier can stop plastic in rivers and canals before it enters the sea. Donate now to support our mission! Every day a staggering amount of waste ends up in our water where it causes severe damage to marine and human life. Sea turtles and fish get entangled in plastic, ships are obstructed in their paths, and microplastics form a health hazard for the smallest to the largest organisms. This problem is recognized more and more, by the general public, as well as businesses and governments. We believe plastic waste can be caught before it reaches the oceans. Current solutions that stop waste in the rivers have two major drawbacks; they block ship traffic and/or hinder fish migration. We found an elegant solution that blocks waste in the river but also allows the passage of fish and ships: a barrier of bubbles. The Bubble Barrier is created by pumping air through a tube with holes, which is placed on the bottom of the river. The rising bubbles result in an upwards current which brings the waste to the surface. At the surface, the water flow is directed sideways and the waste is being stopped from flowing downstream. By placing two Bubble Barriers diagonally in the waterway, we block plastics from moving downstream and make clever use of the current of the river to direct the waste to the banks. The waste accumulates on the side of the river where it can easily be collected with a catchment system. Fish can pass through the bubbles, underneath the Bubble Tubing or through the fish pass. 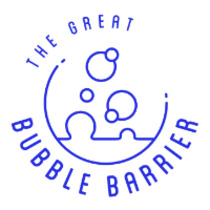 The Great Bubble Barrier was founded in early 2017 by Anne Marieke Eveleens, Saskia Studer and Francis Zoet. In May 2017, the Bubble Barrier was extensively tested at the international water laboratory of Deltares. The TGBB team grew quickly with the addition of Philip Ehrhorn, who had previously tested a 10m Bubble Barrier in Berlin. Based on the results of these pilots we realized a full-scale pilot of 200m in the river IJssel in November 2017, supported by Rijkswaterstaat, Deltares and BAM/vdHerik. This pilot showed that the Bubble Barrier blocked 82-89% of all test material under all weather conditions present during a Dutch November month. Our goal is to realize the Bubble Barrier at smart locations to stop as much plastic as possible in its way to the oceans. We are ready for the next step: a permanent Bubble Barrier.